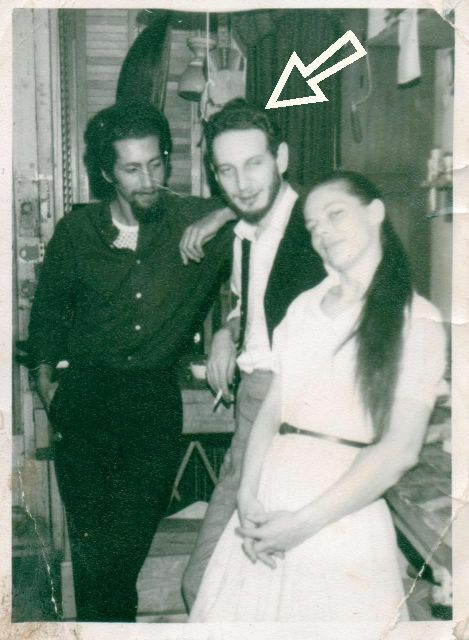 "now the whole world knows what I've known since 1964 when I met you at Noah Wulfe's, Beverly Maher is the soul of the guitar in NYC." 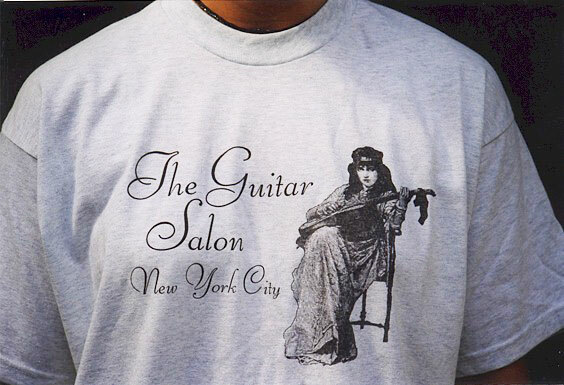 Order your Guitar Salon T-shirt. (free with any guitar purchase). Click here for more info. The famous British builder, with a very long list, comes to N.Y., to grace us with pure, mellow, sounding, beautifully articulated, basses & trebles. 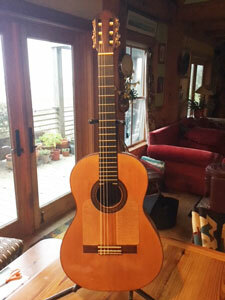 This old flamenco guitar is from one of the greatest builders to come out of the Ramirez workshop. 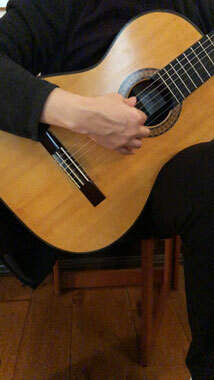 The sound is noble, immediate, clear, sweet, with great sustain. All the adjectives that Barbero's are known for. Barton learned from studying the great masters, past & present. 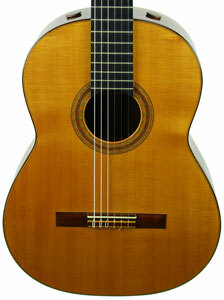 He uses carefully selected woods which produce a warm, bright sound throughout. HIs rosettes are handmade & the tuners are Sloane's with dark pearl buttons.,giving the guitar a "mysterious look. 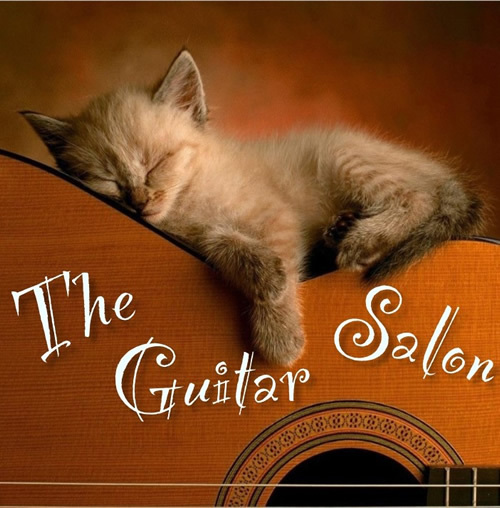 "(quoted by a guitarist) Vladislav Blaha & Nikita Koshkin amongst others, play Barton guitars. 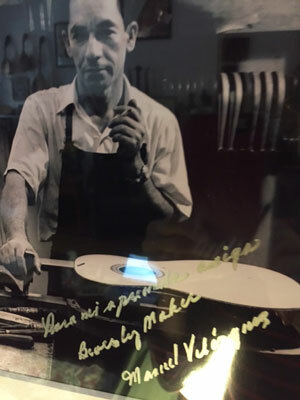 Berg was born in Sweden, studied in Canada, U.K. & finally in the U.S. with Robert Ruck & Jeff Elliott, two of the maestros of the lutherie world. 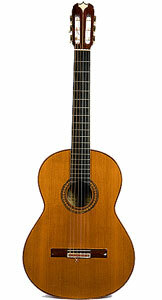 This guitar has all the subtleties & expression you would find in the finest builders plus a dash of his own. Even though it's old, it's hardly been played. Braun was born in Germany but moved to Vienna. 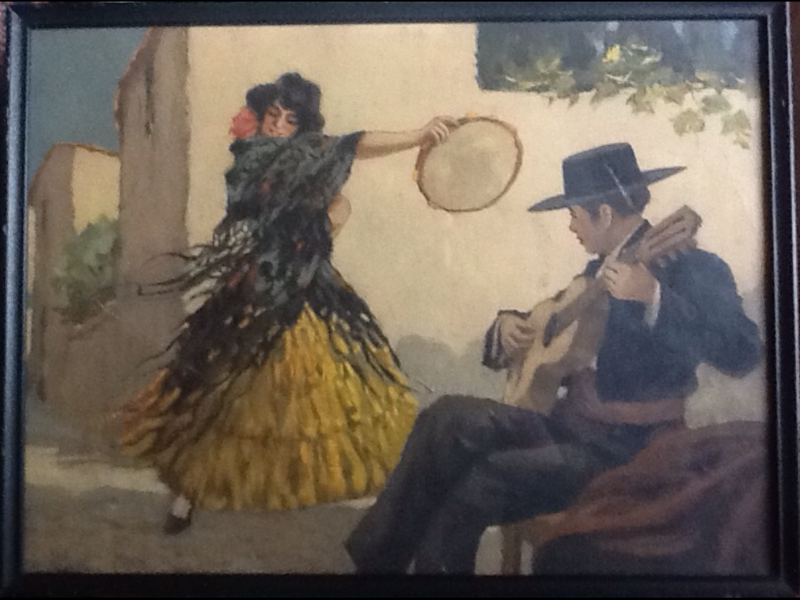 He studied under Jose Romanillos & eventually became his asst. in classes. 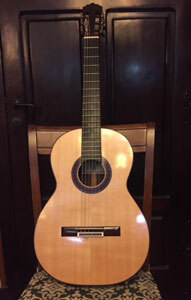 This guitar is so unusual, from the woods, the handmade purfling & rosette, the made to order German Wagner tuners & the small tornavoz inside the sound hole.Torres developed the tornavoz, (small metal cone mounted inside the sound hole to amplify the sound } & it wa used by some luthier's past & present. 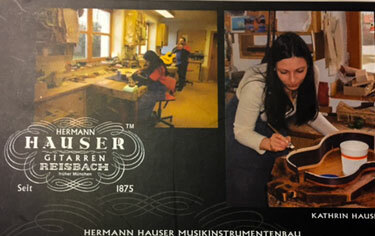 In his birthplace of Budapest, Geza began building guitars in 1981. 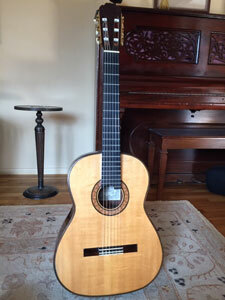 Seven years later he moved to Vancouver and opened for business again,building & restoring guitars, other stringed instruments & teaching classical guitar. 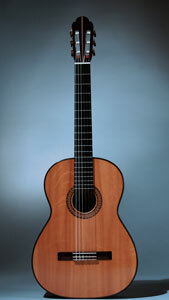 This guitar is a work of art with beautiful woods, inlays, maple bindings , Rodgers tuners & Santos Hernandez bracing. The sound is the closest to a Santos I've heard. 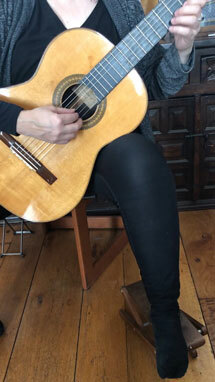 This sound from the famous French luthier, is piano - like, with resonant deep sustaining overtones, deep basses & sweet trebles & with a French accent. 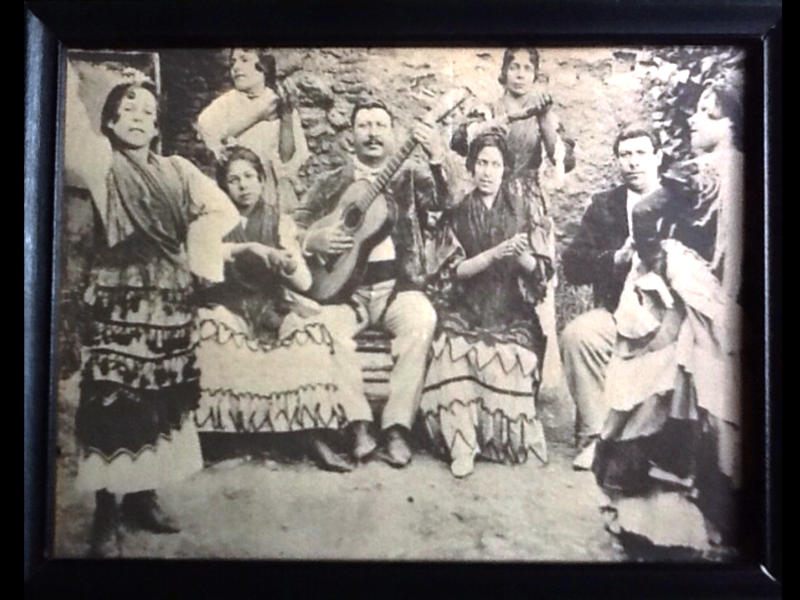 Domingo Lopez Esteso lived from 1882-1937 He began building guitars in 1919 & later taught his nephew Faustino Conde, who taught his 2 brothers, Julio & Mariano. 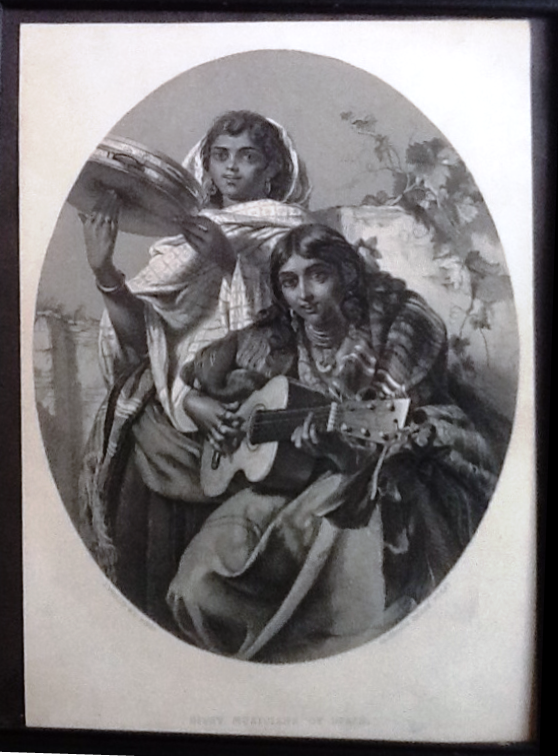 (Conde Hermanos). 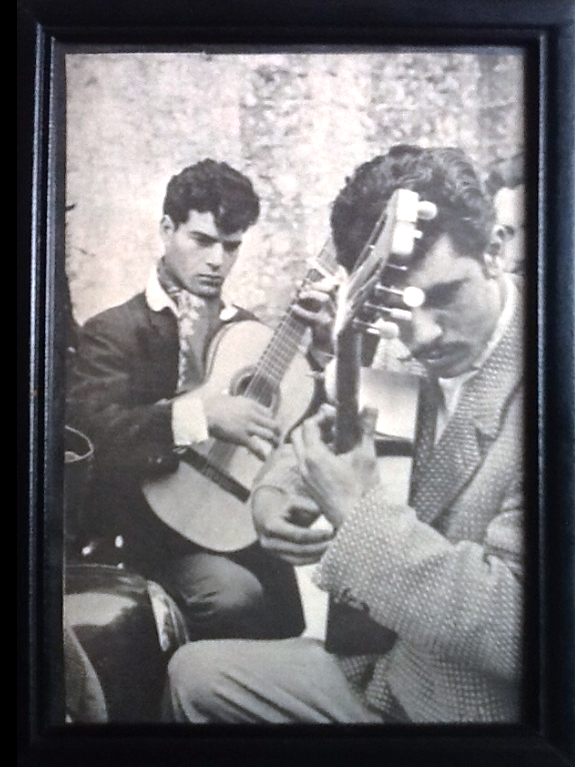 After Esteso's passing, the Conde's built under the label, (Sobrinos de Esteso) Esteso is considered one of the greatest of flamenco builders & the choice of the players bold tablao sound. Dominique Field was a player & then a builder, just like his great early predecessor Robert Bouchet. He became next in line of the great French builders when Daniel Friederich recently retired. You will see & understand his patterns. The sound is all encompassing. It's everything all at once. 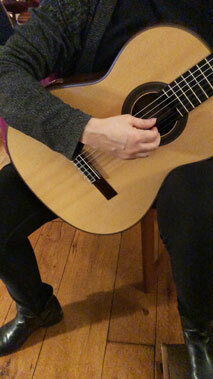 Michelle uses very carefully selected woods to produce deeply inspired guitars. 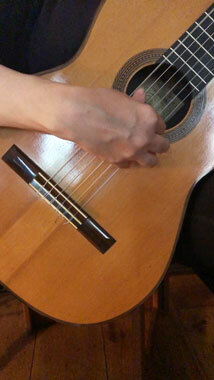 This is a double top with a raised fingerboard. The sound is direct & dramatic. 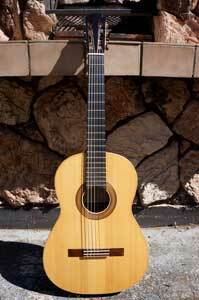 This is a custom made guitar, started by Ignacio but finished by his son (hijo) after his death. It is in pristine condition, with specially chosen woods. 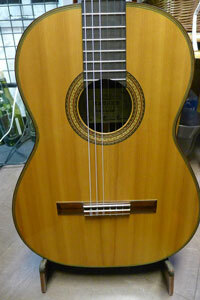 Most of the guitars made by the Fleta son's, Gabriel & Francisco, were cedar, this is spruce, which is rare. It comes with a beautiful Protoge Humi case. 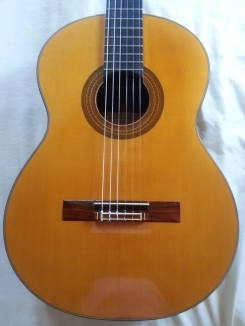 This old beauty is in very good condition with no cracks or scratches, easy to play with a wonderfully rich voice & excellent sustain. 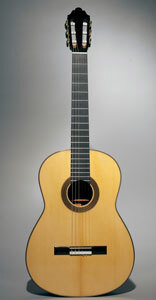 I've seen & heard many great guitars in my many years of buying & selling but this Friederich moved me to tears. The unexpected, explosive sound, the warmth & beauty of the many colors, the purity of the sound, the love of one of the greatest builders of our time, all come through in this extraordinary instrument. 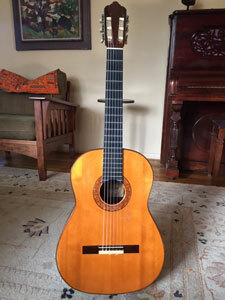 This is a one person guitar, bought in 1971. 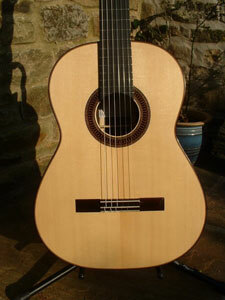 Not John Gilbert the famous actor but John Gilbert the famous luthier. Although Gilbert was formerly an engineer for Hewlett -Packard, he became one of the most esteemed builders who's guitars were played worldwide. The condition is very good with just a repaired hairline crack at the lower bout end. Gilbert had a knack for creating a surround sound with his innovative construction. 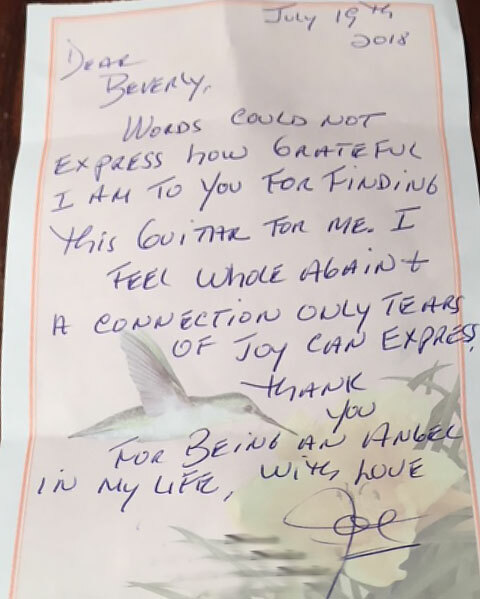 That's why his guitars were in such demand & still are. The rich, tonal fullness is unmistakeable. I'm told by Kathrin Hauser, "the top comes from the Tegersee area in Bavaria. It looks like very old stock from Josef Hauser & Hermann Hauser l.
With woods this old, it can only sound as glorious as it looks !! 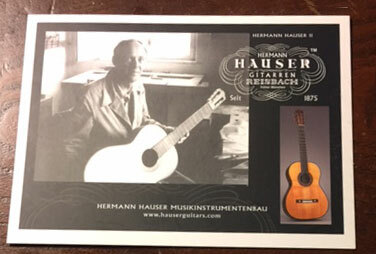 He began working in his father's workshop in 1930 & all guitars were signed by HH I until he took over in 1952 & began signing HH ll until 1983. The last one was # 1050. 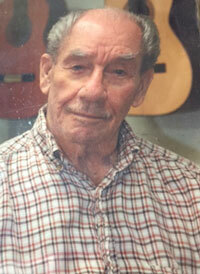 HH ll developed his guitars through the input of his relationships with Segovia & Bream & other notable players. 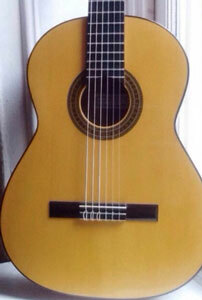 This guitar is in excellent condition except for a repaired hairline crack below the bridge. 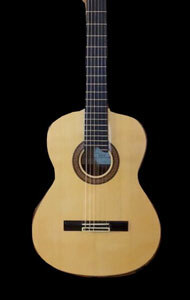 The sound is bright, brilliant & beautiful with excellent playability & response. What a surprisingly eloquent & elegant Hauser this is. 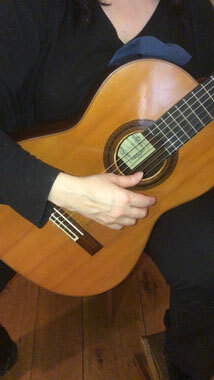 It's bold, not brash with warm sweet tones & is remarkably melodic. 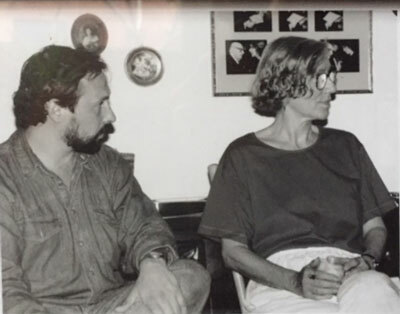 Herman Hauser III and Bevery Maher. 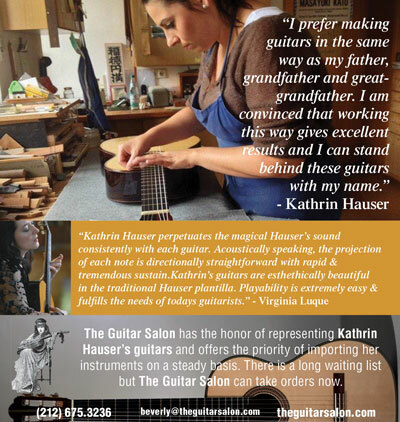 Kathrin is the 4th in the Hauser Dynasty of great luthiers. 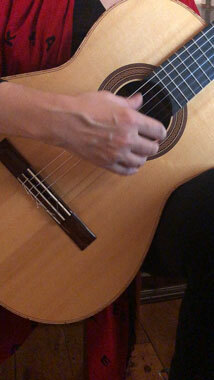 Her guitars possess a long lasting sound, characteristic of the Hauser's unique acoustic quality. In a word, marvelous! They take a long time coming but if you order now you'll be on my priority list. One is available now. A NEW ONE WILL ARRIVE IN SEPTEMBER. With mother of pearl tie block & bridge dots. 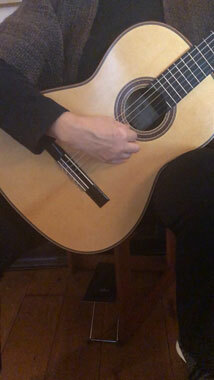 One ,amongst Santos' many accomplishments on the guitar, was his 1st string bracing solution which equalized the troublesome 1st string, making it equally resonant to the 2nd & 3rd. 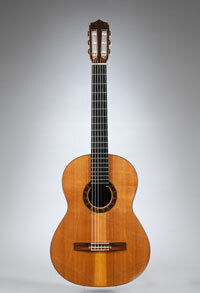 Santos worked in the shop of Manuel Ramirez & is believed to have made the famous 1912 Manuel Ramirez guitar, owned by Segovia & donated to the Met Museum. (which I appraised). This is the best Humphrey I've heard in a long time. It'd extremely bright & focused, with never-ending sustain. I never heard a Humphrey sound like this. This is from his best time period and it's a WOW! 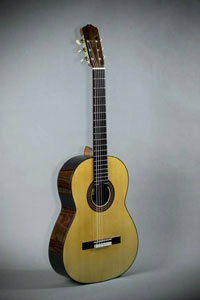 The top is made from an old Steinway grand sound board, the back,sides & bridge are magnificent Brazilian Rosewood. The scale is 660 . 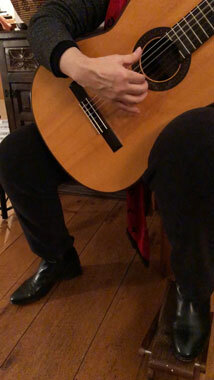 Marty was formerly a research scientist who through a grant from his government , devoted all his time to developing non traditional ,innovative guitars which are loud, responsive & well balanced. 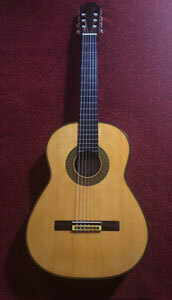 This exquisite, unusual guitar by the famous Rafael Mardones. 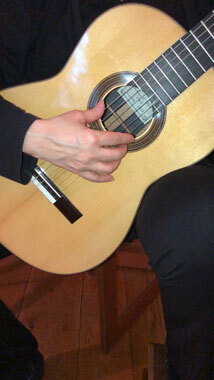 This guitar has the beauty & sustain of his workmanship. The woods are remarkable & the sound is as you would expect. Lopez is one of the most underrated, experienced, Madrid builders.The Summerfield book names him as one of the finest. 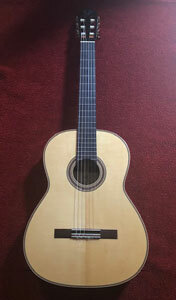 This is Marin' s "Bouchet model, it is named after the esteemed. 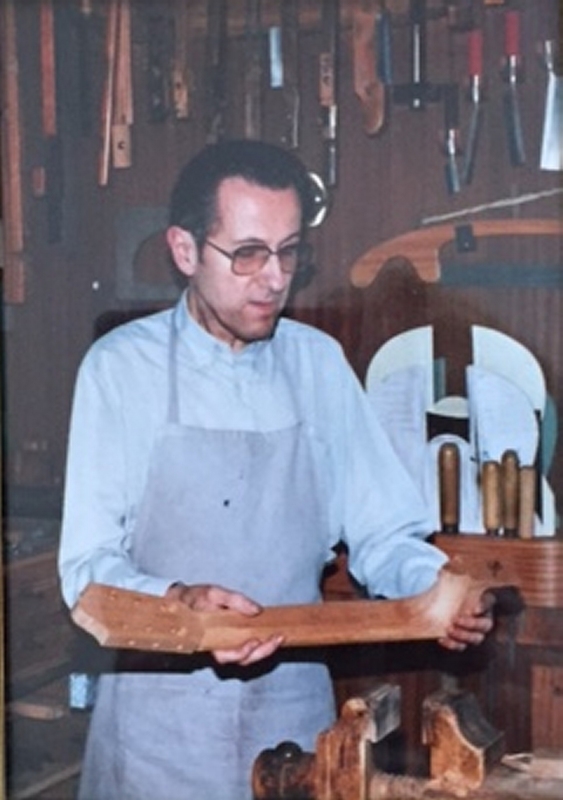 French builder Robert Bouchet, the luthier with whom Marin worked closely with at one period of his career. 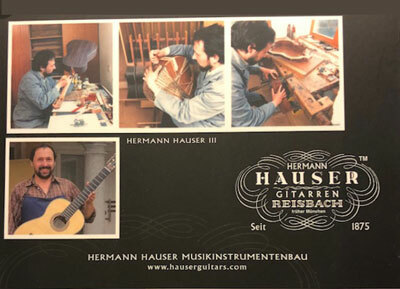 Many builders name their guitars after those that they admire, such as,"Hauser model" or "Fleta model" etc., not having worked with them but admiring their work &/or their bracing patterns. 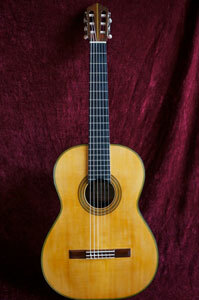 Marin is the father of the Famous Granada School of Luthiers. 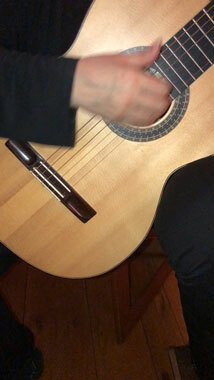 His guitars are always, open, sweet & mellow but this is one of the loudest Marin's I've heard. 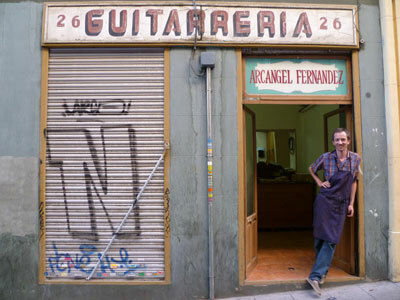 There's one street in Granada, lined with guitar builders in small shops, leading to the Alhambra, the jewel of Granada. 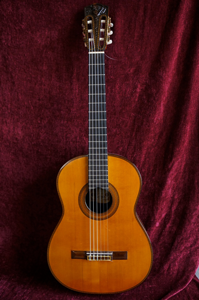 This is his “Bouchet”model named after the great French luthier Robert Bouchet, whom Marin worked with at one period in his life. He has been building guitars for over 40 years & chosen by many musicians for the playability, projection & range of colors produced by these instruments. 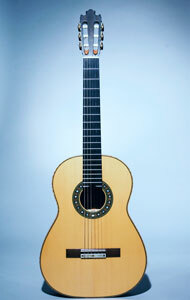 His workmanship & big bright sound make him one of the outstanding Austalian builders. His newer guitars are over $12,000. This is the best deal in town. The eagerly awaited Plattner coming soon! It's fantastic. 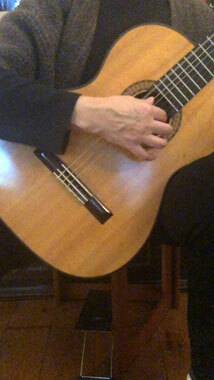 Tremendous presence, amazing sustain, (way above the 12th fret) & great balance. 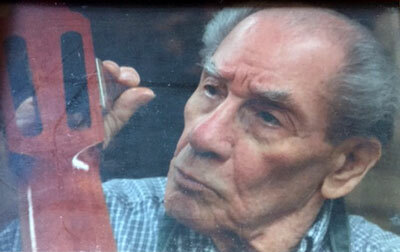 Plattner 's mentor Arcangel Fernandez, retired & left the shop to him. 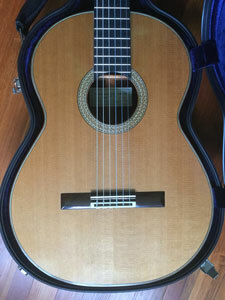 His guitars have a very similar quality to Fernandez, but with his own imprint. The limited edition Centenario guitars, were built to commemorate the first centennial of the Ramirez factory founded in 1882. 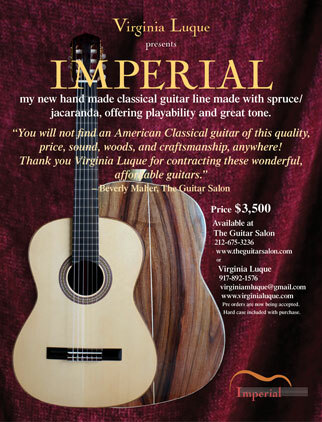 Only the finest, most beautiful woods were chosen, along with the exquisite headstock & tuning machines. The sound is typically Ramirez: full & lush, only more of both. 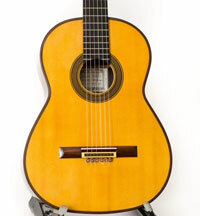 This gorgeous Guitar was built in 1994 by the late David Rubio himself. It is made of some of the finest materials that I have ever seen. 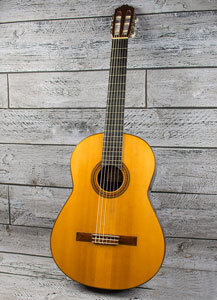 The European spruce soundboard has a tight grain seen rarely seen anymore and the very dark rich old growth Brazilian back and sides is very beautiful. The sound is lush, deep, dark, clear and projects very well. 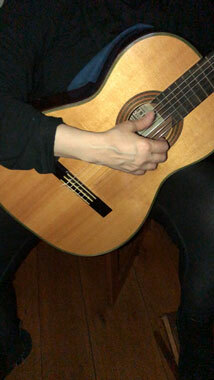 It is very easy to play. 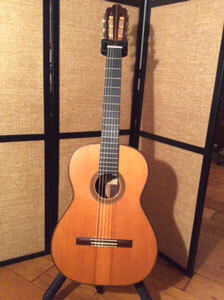 This is a fine concert guitar made by one of the best makers of the 20th century. 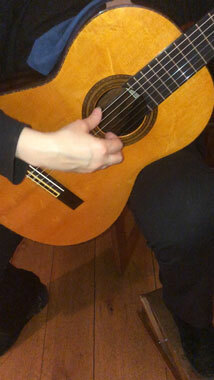 The guitar has the original French polish, is in excellent ++ condition with no cracks or repairs. This guitar has portals, Sloane tuners, the works. It formerly belonged to Manuel Barrueco. It s a Ruck & it s mint & it has it all: easy playability , great projection & lush sound. 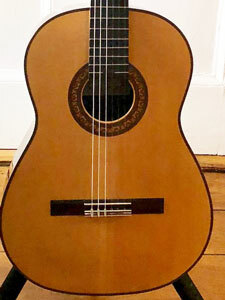 His beautiful carved headstock is so indicitive of the Art Deco architecture of Barcelona , where he lived. 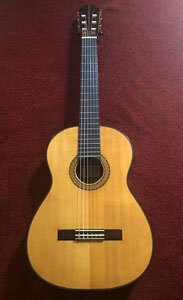 The sound of this guitar is, mellow, pure, old world sound, never to be duplicated in later Spanish guitars . 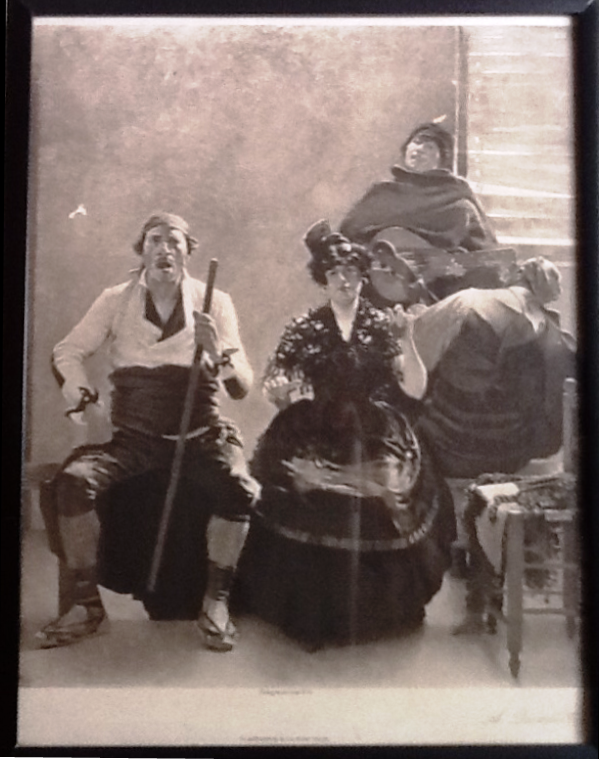 Miguel was the son of Francisco Simplicio, who died in 1932. Francisco was the heir to Enrique Garcia. 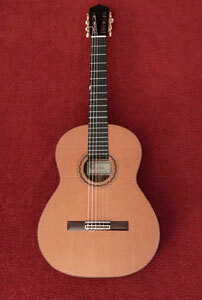 This guitar was made by Francisco & finished by his son Miguel. The guitars Miguel made have a very different label. As you can see, this one is the same as that of his father & of Enrique Garcia. 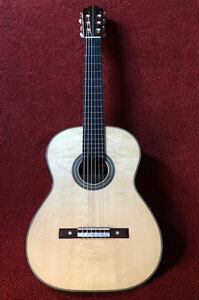 The back is the same wood used by his predecessors & the deorative, woman with lyre, carved headstock, similar to the architecture of the famous Antoni Gaudi, whose works adorn the city of Barcelona. According to the article by Daniel Friederich in Orfeo magazine, there are only 5 guitars made with this particular headstock. The basses are strong & the trebles are sweet & lyrical. of the desire of all players. 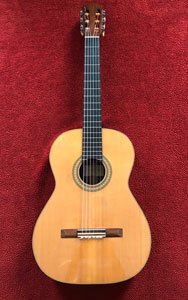 Un altra grande chitarra, from Tacchi. 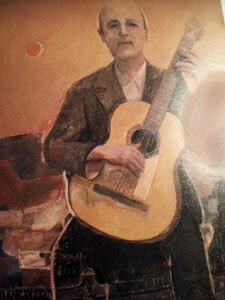 The 50's,the most sought after period of Manuel's guitars. Except for a repaired hairline crack under the bridge, it's in very good shape. 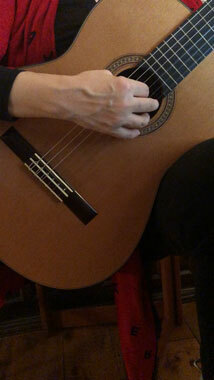 The sound is mellow, sweet & yet with tremendous volume. Manuel had the secret. The sound that most guitarist's listen for. 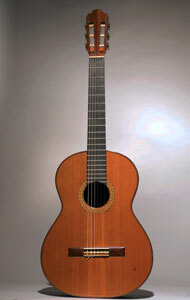 This is an exact copy of a 1937 Hauser guitar. 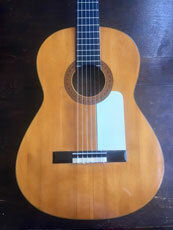 Except for some back marks & smudges,it s in good shape.I could hve refinished the back but I prefer to maintain the dignity & provenance of guitars. 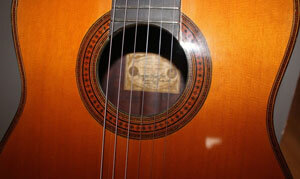 The one owner, was a professional guitarist, mostly played steel strings. He also has several D Angelicos for sale but just one Velazquez. 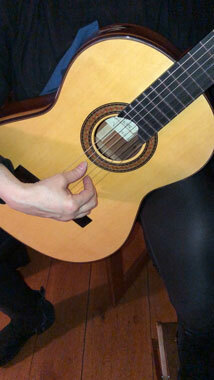 Steel players usually have one nylon guitar, invariably, Velazquez. I ve sold them to several players: Paul Simon, Keith Richards, to name a few. 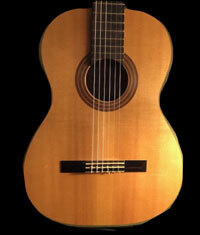 They love the clarity, balance , sweetness of Manuel s guitars. He worked in NY until 1963, when he left for P.R. 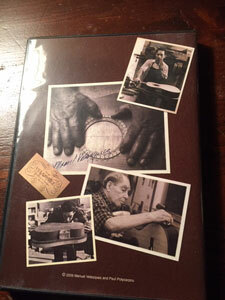 I love the guitar, the story behind it & the builder. 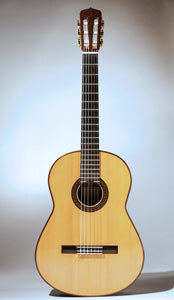 The top of this guitar has spectacular bearclaw spruce that Manuel used with special guitars. 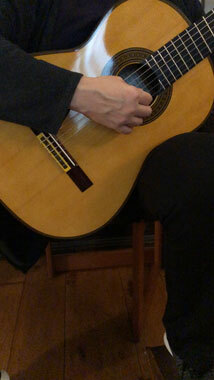 Although the label says "1969", the inside where he signs his name is marked "1968" - so that's when he began to build the guitar. I would actually consider it a '68. 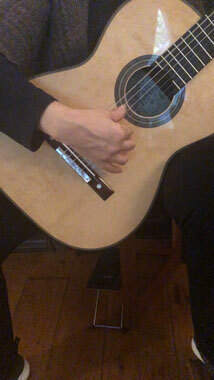 His guitars from this era, with these woods, are so clear throughout the neck, with singing tones that don't stop. Look at those woods! His special bear claw top used on this guitar & the matched Indian back. Noah Wulfe used to go to Yugoslavia, (as it was called) to get these woods for Manuel. 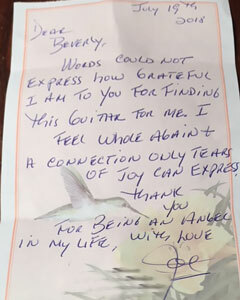 I have to say the same thing for all of his guitars from the 60's, they sound heavenly: clear, crisp & collectible. This is another MV gem. 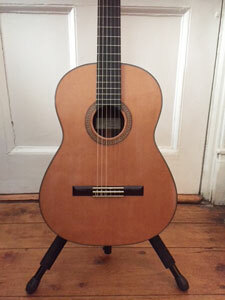 Manuel made these slightly larger bodied guitars in the 70's but not too many cedars. 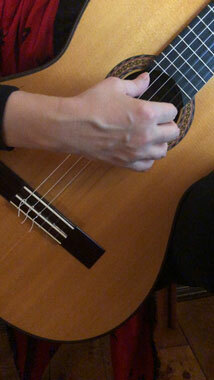 The sound is rich & balanced, good for classical or other kinds of music. 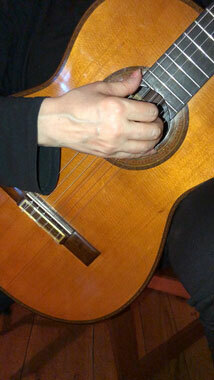 You can always tell a Velazquez by the purity of sound. This has a small mark on the upper bout, otherwise it's in good shape. This is a good buy!! 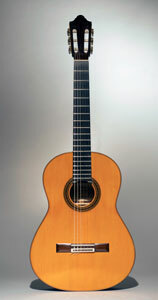 This is one of the best guitars from Manuel's 80's collection. It's lusciously sonorous with velvety tones , both basses & trebles. 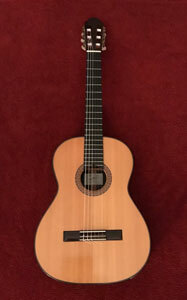 This is one of the last guitars made by Manuel. The woods are extraordinary. The highly figured Spruce top & the dark Brazilian matched back, accent the glorious sound of another gift from our great American builder, our Hauser. 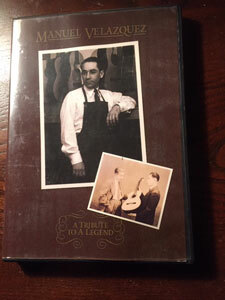 This is a very special, made for & dedicated to the famous maker of the Velazquez documentary, Paul Polycarpou. Manuel was so moved by the depiction of him & his art & love of guitars, as told by Paul, that he made this guitar for him. 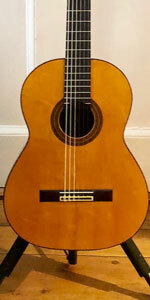 It is dedicated to Antonio Torres, the father of the modern guitar & under the top dedicated to Paul Polycarpou. It has Rodgers tuners & Velazquez love.